This FreeStyle Points tracker spreadsheet tracks your daily and weekly SmartPoints for Weight Watchers new program. So if you are free styling with your weight loss plan, then download this file to keep you on track. The new WW FreeStyle plan has some changes, good changes. One of the good changes is you can now roll-over unused daily points...but only up to 4. The formulas in this spreadsheet take into account this new changes. So for those days you don't eat all your SmartPoints, the tracker will automatically roll them over for you and add them to your weekly allowance. This means if you have big plans for the weekend, you can eat lighter during the week and bank up some extra points to splurge on the big day...but don't splurge beyond what you have rolled over. Below you will find two links to download the tracking files. The first one is the spreadsheet, which is in a zip file. Once you download this, you will have to unzip it to use the Excel spreadsheet. Don't have Excel? Don't worry. I've also provided a link to a software called OpenOffice. This is a free open source program that is completely compatible to Microsoft Office, including Excel. So without further ado, here's the link to the spreadsheet. Download it, unzip it and start tracking your SmartPoints today. For those of you that don't have Excel, as promised here's the link to the OpenOffice software. Use this link to download the OpenOffice software. This next file to download is a simple PDF file which you can save to your computer and then print it off each day. The PDF file is not interactive...meaning you have to write in the information and do the calculations yourself. But sometimes we are not near our computers so having a simple method to write it down allows you to track it where ever you are. You can always re-key this information into the spreadsheet later in the day and then let it do the calculations for you. Here is the link for the PDF file. For the PDF file, it is meant to track the daily activity of the foods you eat and FitPoints. If you have carry over points, be sure to record the correct weekly allowance by adding these in. Then transfer this new allowance number to the next days printout and start recording again. If you haven't moved to the FreeStyle plan, or you are still on the Plus or original plan, then use this points tracker spreadsheet instead. Some days I just get tired of tracking my points. But I still faithfully get out my computer and open the FreeStyle Points tracker and do it. Why? Because tracking does work. When all is said and done, losing weight, regardless of what plan you are following, is all about choices...and not just any choice, but healthy choices. Each of these nutritional values has a different weight applied to the calculation. For instance, sugar is valued higher than calories or saturated fats. This means foods higher in sugar will give you higher SmartPoints. Protein has a positive effect on the outcome of the calculation. So if a food item is higher in protein, chances are it will lower the points value for that item. If you ate just 2 chocolate chip cookies, you would have used up 6 points in that snack alone. However, a 3oz flat iron steak would only be 5 SmartPoints. So you see, tracking helps lead you toward healthier options. The healthier the foods, the more you can eat for less points than the high fats or high sugary foods. 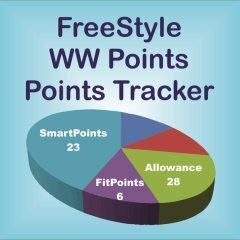 The Freestyle Points tracker spreadsheet has a built in SmartPoints calculator. So if you are not sure that you are making the healthiest choice, calculate the points values first before you take that first bite. Another reason tracking helps is your activity. Say you walked with your neighbor in the morning and then again at night. If you went beyond the 3,000 steps that are part of the FreeStyle plan, then you would have earned some FitPoints. If you tracked this, then you would know if you have extra points you can eat without going over your daily or weekly allowance. Not all foods have to be tracked as now with WW FreeStyle, there are over 200 foods that are zero points (and guilt free). So if you had 3 oz chicken breast, veggies (no dressing) and say a 1/2 cup of unsweetened applesauce, you would not have to get out your FreeStyle Points tracker for that meal as these are all zero point items. Here is the complete list of zero point foods on the FreeStyle plan. While using this FreeStyle Points tracker may seem like a pain in the you know what sometimes, it does pay to track. So eat, track and reach your weight loss goals. Learn how the values are calculated for the foods you eat on the SmartPoints Plan. If you are thinking of switching over to the new FreeStyle plan, then check out this article on what's new, what stayed the same and more. Live it up guilt free with many of these chicken recipes. Many use skinless chicken breast as an ingredient making the SmartPoints lower.